As weekly news stories report on packed emergency rooms and health professionals burning out, one new Quebec start-up is proposing a solution to hospital overcrowding. AkioSoft's concept is simple: users need to fill out a digital form from their home or wherever they are. The questions are determined by an artificially intelligent virtual robot and vary based on the patient's previous answers. Then, the interface puts them in touch with a remote doctor, who will be able to prescribe them medication or refer them to a specialist. Founder Francis Nicloux, who is a trained doctor, believes that his creation, which took five years of research and launched in fall 2017, will "revolutionize" the traditional health-care field. In most of the world, the same problems persist: access to health care and constantly increasing costs. Artificially intelligent telemedicine can help fill a very real need. For example, if a patient has eye pain, the robot might ask if they've lost weight recently. Or if they've lost any fingernails. The questions are sometimes surprising, but make it possible to establish a diagnostic list from a database containing 8,000 illnesses. There are certain limits to virtual appointments. "Of course we won't be able to diagnose cancer or anything serious like that," Mr. Nicloux explained. It won't be possible to diagnose diabetes or high blood pressure either, for example, but the platform would make it possible to do a remote follow-up. It costs $35 for an annual membership, plus $20 to $40 per consultation with a doctor. The start-up is working with four doctors, but the number is expected to increase. AkioSoft founder Francis Nicloux meets with his employees in their offices in Saint-Bruno-de-Montarville, Que. 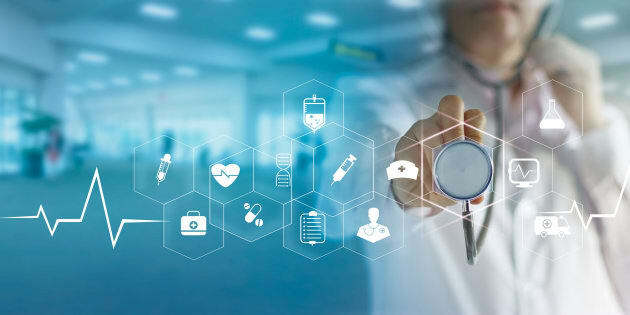 An advantage of telemedicine is that doctors are available relatively quickly once they're connected to the online platform. Another advantage is the ability to reach medical advice from faraway places. A doctor was even able to treat patients remotely while he was in PyeongChang, South Korea attending the Olympics, as reported recently in the Journal de Montréal. "The idea of borders, the idea of walls, the idea of time is blown wide open when a doctor can have a virtual consultation anytime, even if he's at the beach," said Nicloux. The AkioSoft founder admitted that his system eliminates jobs, both in terms of nurses who check symptoms, and doctors who ask follow-up questions, identify the problem and prescribe medication. The idea of borders, the idea of walls, the idea of time is blown wide open when a doctor can have a virtual consultation anytime, even if he's at the beach. He estimates that in order to cover everyone in Quebec through telemedicine, the province would need only 2,000 doctors. There are currently around 10,000. But in the long run, he believes access to virtual care could be beneficial, especially for patients in smaller towns. He is already planning to open his first microclinic, where patients would show up with a code to check their vital signs or do a urine test, for example. The rest of the consultation would happen online. Quebec Premier Philippe Couillard has said he wants to make telemedicine one of the priorities for the future. "It will become an everyday reality in the new Quebec," he said during a speech last November. Nicloux believes telemedicine is already an unavoidable reality and goes a step further in his predictions for the medicine of the future. You can already buy an endoscope — a flexible tube with a camera — on Amazon to take photos that you could send to a doctor. With a stethoscope, you could record your heartbeats onto MP3. You send your doctor the recording and you're all set. "Artificial intelligence will completely take over the world within the next 10 years," said the AkioSoft founder. "So, we won't be able to decide whether we want it or not. The real question is: how do we adapt to it?"